Alexandra Bannerman, Product Marketing Manager, explains how the Criteo Engine uses data to optimize your ads. Publisher interaction data is based on Criteo’s granular visibility of shopper interaction with websites and apps. Criteo has the world’s largest open shopper data set, which means our machine learning technology has all the detailed information required to precisely predict what inspires shoppers and drive higher engagement. Let’s see how Identity and Interest data informs the Criteo Engine on shopper behavior. Instead of taking a snapshot of information at the point of serving an ad, the Criteo Engine uses historical and real-time data to aggregate individual shopper activity, online and offline, over moving time windows – evaluating the intensity of shopper intent at any given time. When a shopper browses online, the Criteo Engine utilizes over 120 shopping signals to work out, at that moment, the shopper’s propensity to engage, which specific products to recommend, and also what ad design they’ll best respond to. Because the Criteo Engine calculates this in real-time, and on an individual shopper level rather than for broad audience segments, the resulting ad impression is perfectly optimized for the shopper at that specific point along their shopping journey. Here’s a quick example showing how the Criteo Engine uses identity and interest data to determine shopper intent and predict shopper behavior. Identity and interest data from the Criteo Shopper Graph might inform the Engine that ‘Shopper A’ has looked at a hat and a dress on your website over a 30-day period, ‘Shopper B’ has looked at ten hats in just seven days, and ‘Shopper C’ has looked at three hats on your website and purchased one in-store within seven days. The Criteo Engine’s machine learning algorithms are able to use this information, as well as conversion data trends, to predict that ‘Shopper B’ is most likely to convert at this point, and that a specific hat is the best one to recommend to them. While this is a basic example, real-world situations are considerably more complex, with the Criteo Engine taking into account those 120+ shopping signals every time. Remember, the privacy of shoppers is protected at all times; Criteo is able to assign a randomly generated ID to each shopper, across devices and offline, using only pseudonymous user data, and directly identifying information is never willingly captured. Criteo adheres to regulations around the world to ensure that the privacy of shoppers is protected at all times. We are able to assign randomly generated IDs to each shopper across devices and offline, using technologies that rely only on pseudonymous user data in order to preserve shopper identity/privacy. This pseudonymous data preserves the privacy of shoppers, but still provides a rich understanding of shopping intent. We follow industry best practices to secure the data that we collect, are compliant with regulations that determine how consumer data is retained, and ensure compliance is adhered to globally with our technologies. Criteo also remains a leader in clearly stating the rights that consumers have to access their data, what data is collected, how it is used, and how they can opt-out. Criteo is fully compliant with the European Union’s General Data Protection Regulation (GDPR) which came into effect on May 25, 2018. The regulation applies to the processing of personal data collected in the EU, even if it is processed by companies that are located outside of Europe. Publisher interaction data helps the Criteo Engine find the best opportunities to show your ads. By processing billions of data points daily from thousands of premium publishers connected to Criteo, our Engine evaluates the performance of different types of publishers and ad inventory, based on shopper interactions with them. For example, shoppers will interact differently with a 600x160px top-of-page ad unit than they would with a 300x250px ad unit midway down the page – and this performance also varies depending on the website in question. These insights help the Criteo Engine determine inventory value for each impression, and bid accordingly to reach the right shoppers. Here’s an example which ties together the ways in which the Criteo Engine uses data. Christina has been looking at your products, both online and offline. Now, she’s browsing various publisher web sites. – And the Engine’s Kinetic Design technology takes into account the visual preferences Christina has shown previously, chooses the best ad design to create, and renders the ad to fit the chosen inventory. All this happens in real-time to serve Christina the best possible ad for products she’s likely to convert for in that moment! 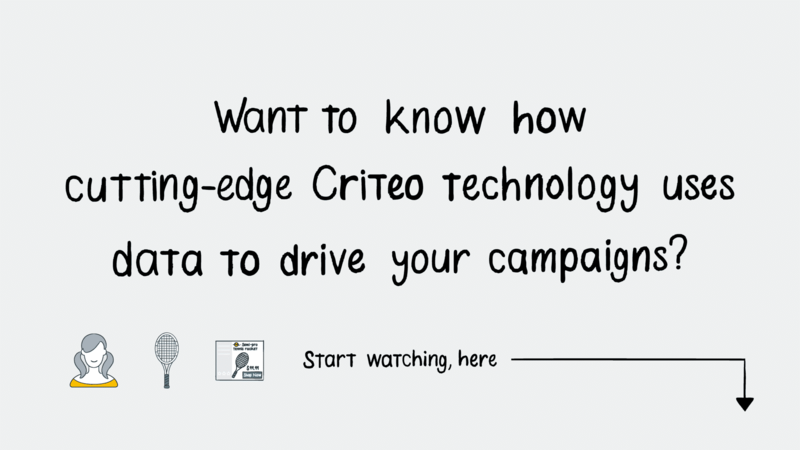 So there you have it – that’s how the Criteo Engine uses data to optimize your ads.